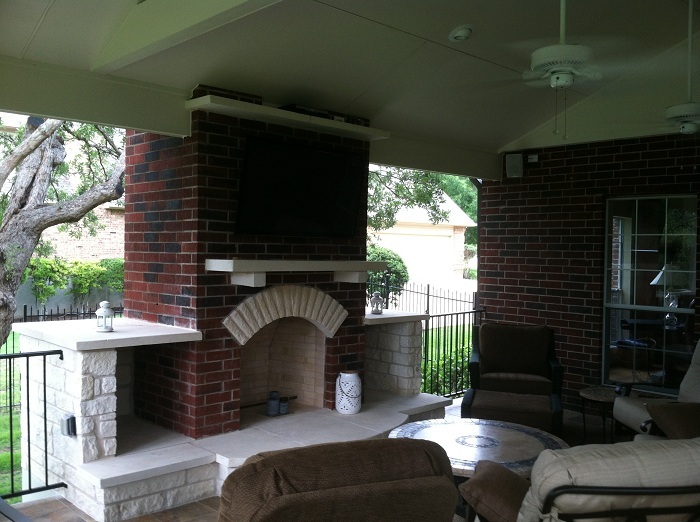 The material choices for this covered patio in Austin, TX make this space a true gem of dazzling design. At first glance, when you look at this recently completed addition in Austin, TX you will assume it to be a typical covered patio under a roof that mimics the look of a large gazebo, but indeed it is so much more than that. 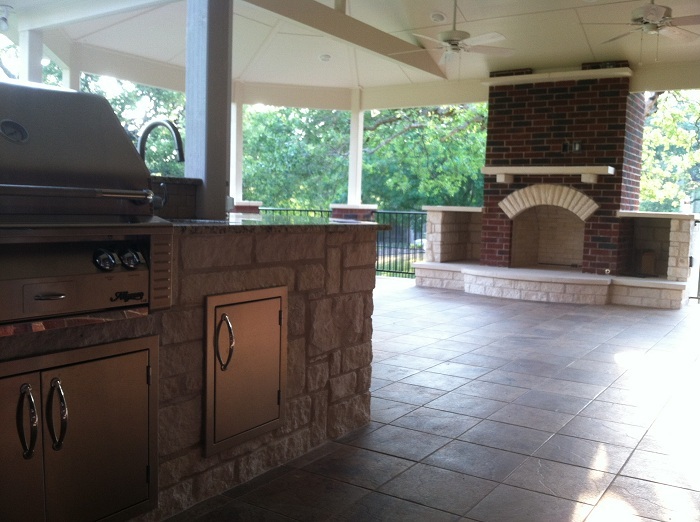 At closer inspection you will see the covered patio has all the amenities that make an outdoor structure great. The space contains an outdoor kitchen, abundant dining and seating space and an outdoor fireplace. The materials used in this construction are some of the finest used in outdoor structure designs. 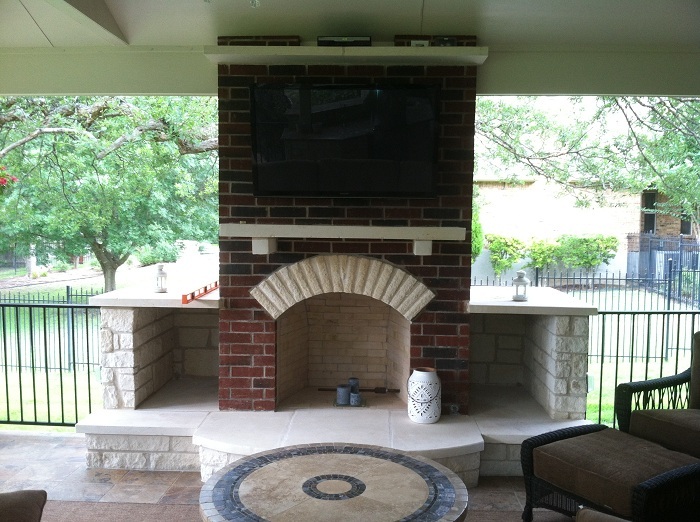 A limestone decorative arched key and custom mantel grace the facade of the patio’s outdoor fireplace. 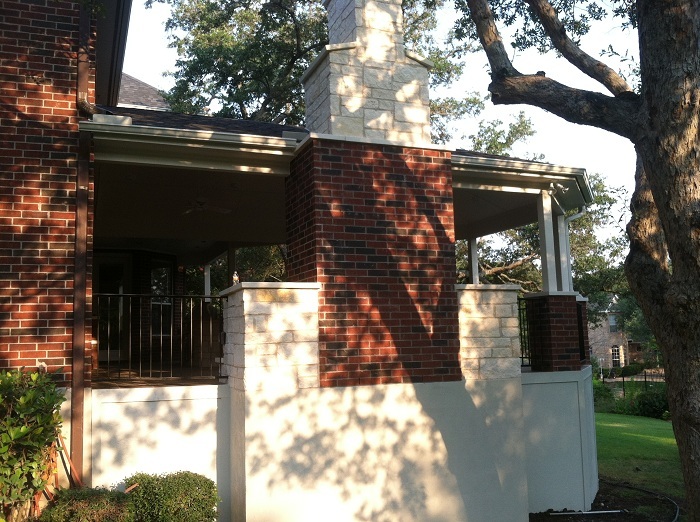 On the outdoor fireplace we used a combination of brick that was chosen to match the brick used on the existing home and stunning white limestone. We used the limestone on the hearth and firebox that surround the fireplace and also added a decorative key made of limestone into the area right above the hearth. We also carried the use of limestone into the outdoor kitchen area where we used it to finish out the area on the side of the bar. Limestone is a solid choice for use in outdoor structures such as these, not only for its beauty but also for its density. Limestone is a dense sedimentary rock that is very hard. On this project we used white limestone, but limestone is available in a wide range of colors such as vanilla, beige, tan and darker hues like taupe and dark wood tones. Using limestone can also help bridge the gap between two separate design styles. Limestone is a transitional material and adding it in small touches or in a wide spectrum can help you mix two styles such as traditional and modern more easily. 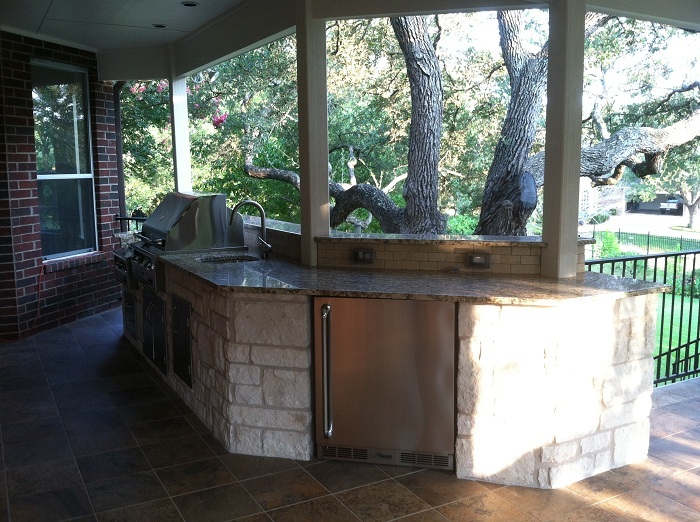 We combined Limestone and granite counter tops to the outdoor kitchen to make the area unforgettable. Along with using limestone around the side of the bar/serving area in the patio cover’s outdoor kitchen area, we also brought in granite for the counter-tops in a complimentary neutral color. Granite is another natural stone. Granite is quarried from natural granite beds in large deposits beneath the earth’s surface. It comes in a wide arrange of hues from pink to black and is perfect for use in kitchens because of its resistant to man-made mishaps that are common in a kitchen setting. Granite is alkali and acid resistant, boiling water, oils, and wines will not affect the granite and granite is easy to clean. The material also offers resiliency to cuts and scratches as well. The floor of the patio cover is finished in beautiful 12 x 12 ceramic tiles which carry the theme of natural stone influence used in the entire design of the space. Tile is easy to clean and will withstand the test of time better than wood, and it also stays cooler in the warm Texas weather and helps keep the space cooler by a few degrees. 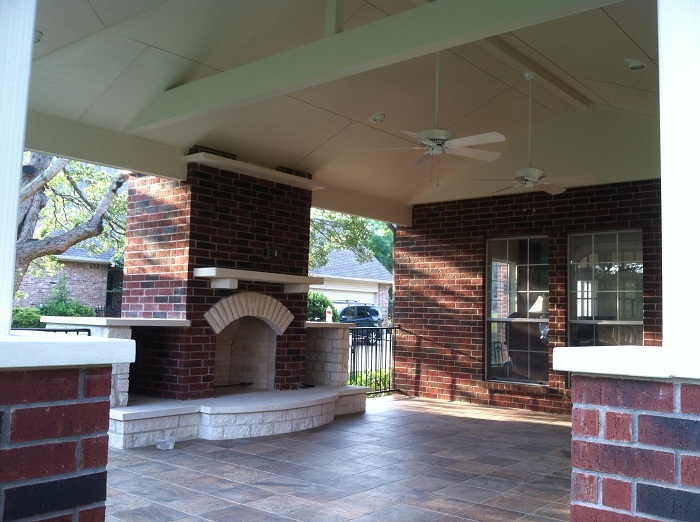 The use of stone, combined with the ceiling fans we installed in the covered patio will equal more enjoyment on the patio on those sultry days. 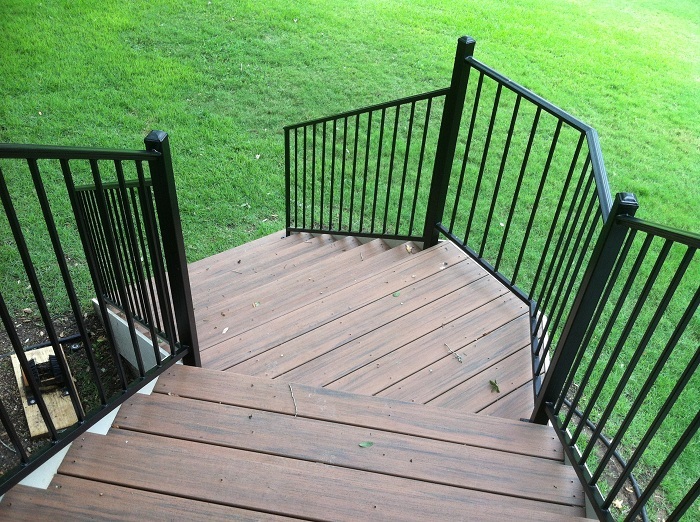 As you descend off of the covered patio into the beautifully landscaped backyard you will also notice the clever use of high-quality composite decking on the steps. This will make for easy upkeep and low-maintenance in keeping this stairway looking like new for many years to come. We paired the rich hues used in the steps alongside a custom iron railing for added elegance. The entire completed project exudes an elegance that ties in all the uses of various materials into an eclectic style. 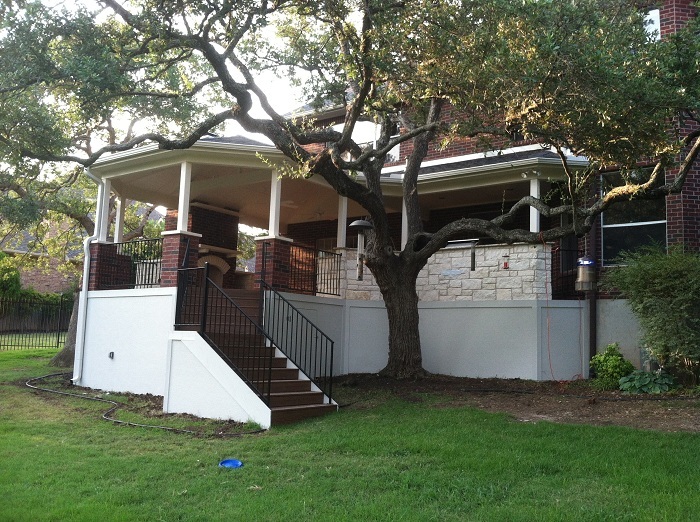 The Austin homeowners are ecstatic about all the outdoor living opportunities their space has opened up for them. They view the covered patio as an extension of living space, and look forward to enjoying all it has to offer in the years to come. The mixed medias of limestone, ceramic, granite and brick make for an eclectic mix of texture and neutral harmony. You can view more inspiring views of past covered patio projects by visiting our covered patio photo gallery located on our website. This entry was posted on July 22, 2012 by austinporchandpatio. It was filed under Covered patio Austin, Covered Patios, Limestone, Materials, Natural stone outdoor structures, Uncategorized and was tagged with Archadeck of Austin, Archadeck of Austin design, Austin cabana, Austin covered patio, Austin custom covered patios, Austin custom stone outdoor kitchens, Austin gazebo-style patio covers, Austin Limestone outdoor fireplaces, Austin Limestone outdoor kitchens, Austin octagonal roofed covered patios, Austin outdoor fire place, Outdoor kitchens Austin TX, Unique patio designs Austin TX.